As more and more people begin to think about raising backyard chickens – we thought for today’s farm update we would take you through the basics in raising your own – from chicks to coop! Add in that chickens really do have their own personalities, and quite honestly – our little farm wouldn’t be the same without them! They are the ultimate all-purpose addition to any home, farm, backyard garden or homestead. Chickens are extremely easy to care for – on average 5 minutes a day to fill up their feeder, give them fresh water, and collect the day’s eggs. In addition – about once a month – we will take 15 minutes to clean out the straw in the coop and add to the compost bin – that’s it! You really have to concern yourself with 4 things. Adequate shelter, water, food – and a little space to roam and scratch. Give them that – and they will be more than happy – and so will you! As we often say, happy chickens lay eggs! Although you can start with adult hens – we love raising our “girls” from day-old chicks. Not only is it a lot of fun – it gets them used to us being around them from the get-go. 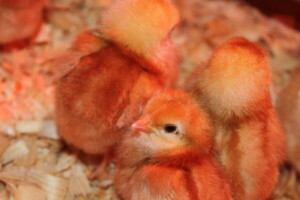 For the first 8 weeks of their life, chicks need to be kept in a brooder. A brooder is nothing more than a temporary home that keeps them safe and warm until they feather out and are ready to take on the world! We made our brooder out of a few scraps of 2 x 4’s and chicken wire for about $10 in materials – however, a metal stock tank, a large wooden crate, or even a sturdy cardboard box can work just fine. We use a heat lamp attached to the brooder to keep the temperature around 90 to 95 degrees during the baby chick’s first 5 to 7 days. As they continue to grow – we move back the heat lamp to cool it down 5 degrees at a time – until by the third or fourth week – they begin to feather and can handle normal room temps. We feed them an organic starter feed for about the first 4 weeks – and then begin to mix in regular pellet food, switching completely to the pellets by week 8. It’s amazing to watch how quickly they learn to use the water and food feeders and begin to become chickens! At 8 weeks or so when they completely feather out – its time to move the chickens to their permanent home. Your chickens health and security all begin with their coop. 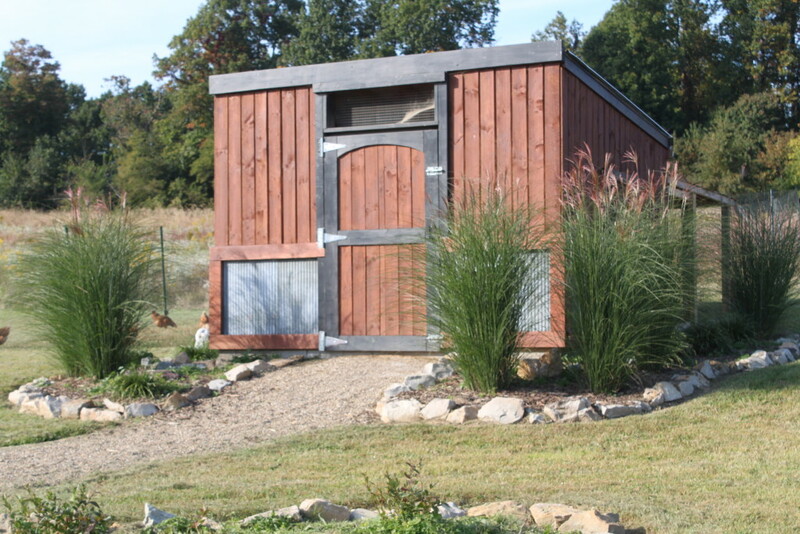 Our 2nd Chicken coop on the farm – built to match our barn. A secure coop is a key to raising backyard chickens. It is best to have about 4 square feet or so of space for each bird in the coop – and provide about 8 to 10 feet per bird in the run. In the spring and fall – we are able to let our chickens completely free range through the garden and landscape – but we do confine them to a 20 x 60 foot run when the garden is in full force. Having plenty of space and not overcrowding your birds keeps your birds healthy. A coop should be well ventilated, easy to access, and be secure so that raccoons, coyote, mink and other predators cannot get in. If you do allow them to free-range – you should also be sure that dogs and other predators cannot easily make it into your yard. In fact – our DIY/ Gardening article this coming Thursday will be all about building a backyard chicken coop! Provide that – and those hens will give you back plenty! On average – our chickens (we have Golden Comets) lay an egg 5 to 6 days each week. And yes – ask anyone who has had a farm fresh egg and they will tell you – they are incredible. They are larger, thicker shelled, and oh-so much tastier than those store bought eggs. And no – you don’t need a noisy rooster. 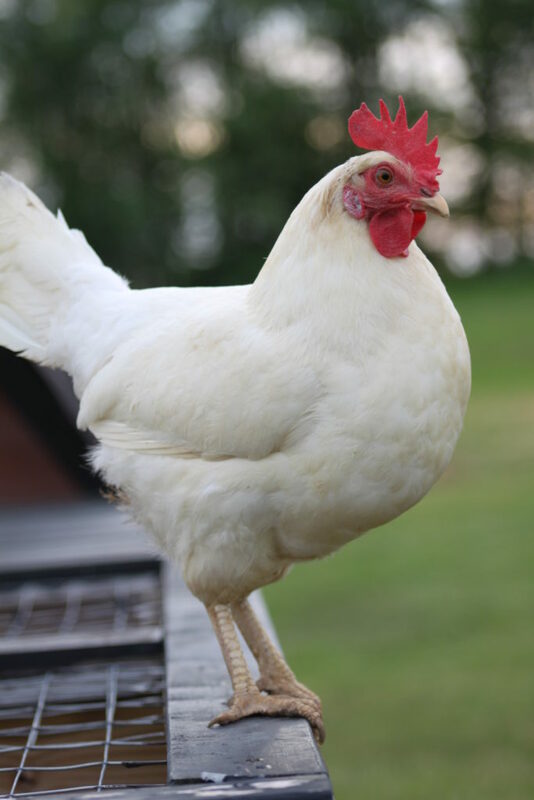 In fact, for those looking to raise a few backyard chickens for eggs – we highly recommend forgoing the rooster! Be extremely careful in using a “sturdy cardboard box” as a brooder. The folks who bought our old country house decided to raise an orphaned litter of puppies, and put them in a cardboard box with a lamp to keep them warm. The box caught fire, and the old house burned to the ground, and they got out safely because my dad had installed one of the early fire alarm systems.